v0.9.11 – Various bug and stability fixes. v0.9.9 – Implementing user feedback and bug fix. Users can now conform audio in additional ways and conform size to 1080HD. v0.9.8 – Implementing user feedback and bug fix. Users can now manually edit paths on the Batch tab. Fixed bug with warning messages when processing single files. v0.9.7 – Implementing user feedback, increasing color fidelity of gamma correction and matrix conversion. Fixed advanced features v0.9.6 disabled. v0.9.6 – Introduces new feature for users who are experiencing color shifts in converted ProRes files. Additional small bug fixes and improvements. v0.9.5 – Small bug fixes. v0.9.4 – Fixed stability issues, added features to process single files. v0.9.3 – Fixed bug experienced by some users where timecode and reel name would not carry over to ProRes files. v0.9.2 – Major improvements. Ability to run multiple instances of FFMBC, ability to add Quicktime gamma compensation, and then inclusion of other advanced features. Apple ProRes is a standard in the video world. If you’re on a Window’s PC then you’re almost out of luck when it comes to encoding ProRes. PRHelper is a professional front-end for FFMBC (a popular version of FFMPEG designed for video professionals) that allows you to automate the encoding process built upon years of workflow knowledge, months of testing and implementation, and phenomenal user feedback. Setup is easy. Using a watch folder, PRHelper converts any compatible video files it finds and places new ProRes files into a destination folder. You can render video straight into a watch folder from all kinds of programs, including Redcine-X Pro or Adobe Media Encoder. PRHelper is smart enough to know when your file is done rendering and then encodes it. This allows you to run batches of video with little supervision. 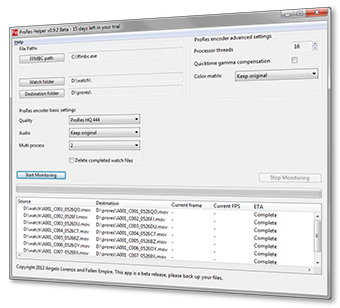 PRHelper recognizes and retains timecode and reel name metadata for professional users without the use of third party tools. FFMBC is a powerful command line program. PRHelper simplifies the process by presenting you with just the options you need to get the job done. Required FFMBC. This is a command line encoder and decoder for many video formats including ProRes. We recommend downloading v0.7 rc7 (32-bit). Due to performance issues, we do not recommend using v0.7 rc8 or any 64-bit versions of FFMBC just yet. Optional Blackmagic Design’s 10bit uncompressed Quicktime codec or Aja’s 10bit uncompressed Quicktime codecs. Many users prefer to render uncompressed video straight into the watch folder from Redcine-X Pro and these are the codecs we recommend. To install BMD’s codecs select any DeckLink product from the dropdown menu on their site, go to the Desktop Video download page, install and you’re set. For Aja, visit their site, select Windows software, and install “KONA 3G Driver for Windows (64-bit), Control Panel, and Notes”. RED .R3D support is handled by exporting uncompressed video from Redcine-X Pro into your watch folder. Start PRHelper and set your FFMBC location, watch folder, destination folder, and encoding settings. Press Start Monitoring in PRHelper. Create an export preset with MOV uncompressed video. Set the export directory to your watch folder and batch export your selected RED .R3D files. As Redcine-X Pro completes a file, PRHelper will recognize it in the watch folder and begin encoding to ProRes. Place the files you want to encode into your watch folder. Sit back and let PRHelper do the work. I’m experiencing slight color shifts, especially in the reds This can occur with some codec combinations. Please check the “Color shift fix for RGB codecs” box. Why does PRHelper access the internet? PRHelper checks for a new version on start up. No identifying information is transmitted to us. Do you support other professional camera formats directly? No. For now we recommend using a program like Adobe Media Encoder to convert video to your watch folder, much like the RED .R3D workflow. While ProRes files processed by FFMBC work great in industry-standard workflows, it has come to our attention that Apple will reject ProRes files encoded by FFMBC when submitting videos to the iTunes store for sale. There is currently no workaround for this and we recommend that your master files for the iTunes store be encoded on a Mac with the proper ProRes codec. Copyright (C) 2013 Angelo Lorenzo and Fallen Empire. All rights reserved.